Another day another cryptic European black metal band. I’m certainly not complaining. Between the 90s and today, impulsive, anarchistic satanism has been replaced by the sophisticated, wine drinking sort: we’re all very smart these days, you see. 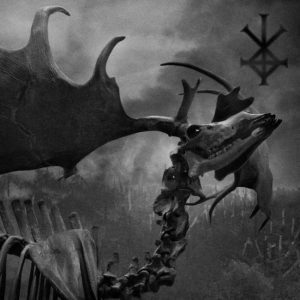 Nature, religion and the occult have been approached with kaleidoscopic freedom in the lyrics and instrumentation of black metal bands for many years, but Poland particularly has spawned many bands of this mysterious, enigmatic variety. The ever pronounceable Mgła, Blaze of Perdition, and Kriegmaschine have shaped their own obtuse compositions from a cast formed at the hands of French tinkerers Deathspell Omega. Outre are another such band. Based in Kracow, Outre‘s sound is a writhing mass of dense and claustrophobic noise which merges the aforementioned elements with off-kilter melody and deftness. 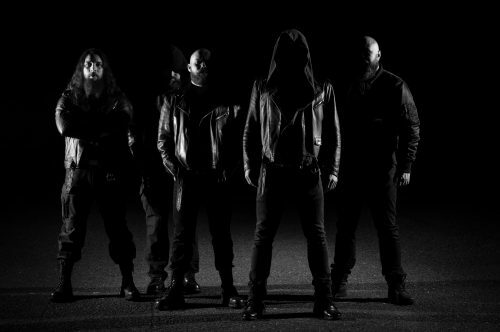 The band utilize electronic sounds – sometimes of the 90’s second wave variety – more than others too, a defining feature in this cloudy smog of black metal bands. Hollow Earth is the five piece’s second full-length. In 2015 Grymm was mightily impressed by Ghost Chants atmosphere, progressive leanings and vocals. Unfortunately, guest vocalist Stawrogin was well and truly a guest and didn’t outstay his welcome despite a lot of people wanting him to. Because of this, Hollow Earth is much a less distinctive entity. Whereas the vocals in Ghost Chants tended to take center stage at times, the vocals in Hollow Earth are more of an atmospheric complementary feature, another dense, impenetrable layer. Hollow Earth is much less melodramatic – for better or for worse. The adjective evil is overused, but the noises that emanate from the opening instrumental track “Spheres within” are disgustingly sinister: violin strings, pounding electronic bass tones, and distant vocal spasms merge and build to a worrying crescendo. This opener slips organically into true opener “The Order of Abhorrence.” What’s instantly noticeable is the change in tone and production – Hollow Earth is frostier, sharper and more impenetrable. The warm tones of Ghost Chants have been fired into the sun. Aided by shimmering strands of electronic noise, “The Order of Abhorrence” is a dense, cold wall. Most impressive is the album’s flow. Transitions are smooth, timely and powerful. “Combustion,” following “The Order of Abhorrence,” does what it says on the tin. It’s a fiery number that cracks and burns as deep, crustier riffs dig heavier claws into the mix. Injections of speed provide lubrication, deep guttural vocal reverberations provide oxygen, and melodic electronic interjections provide turbo flair: Outre find the right balance to feed this burning vehicle. Sometimes one elements takes center stage. In “Let the Earth Be Silent” the alien-like electronics invade the mix, piercing through the throbbing black metal with an aggressive nonchalance. In the same track vocalist Mateusz Zborowski is given more freedom to writhe, snarl, chant and moan – his echoing tones are expressive yet never show-stealing, buried deep enough in the mix to allow the instrumentation to carry the crux of the emotion. The album builds and builds and builds; the closing two tracks are the strongest. “Aberrations” is a vast, memorable track with catchy vocal lines and riffs which crumbles into a chaotic spasm of disharmonious sound at the song’s end. The eight-minute closer “Hollow Earth” unites all of the elements that make the album a success – four minutes of chaos makes way for a rapture. Everything lightens, instruments spread apart, and vocals carry an echoing, choral sheen as the spirits depart from the hollow earth. Hollow Earth is impressively unified – it flows extremely well, amalgamates conflicting elements with tact, and provides more than a few monoliths of excellence to stand out in a crowded scene. It may not be groundbreaking or earth shattering, but it’s certainly powerful.